I absolutely adore reading about the new adult age group, but I'm really struggling to find a NA book I love. I'm beginning to wonder if it's me. Because, just like with Fall From Love, I've liked all the NA books I've read recently well enough--found them interesting, found the story lines compelling--but I haven't been able to become completely engrossed, to connect with them as well as I would like. I enjoyed getting to know the characters in Fall From Love, and I enjoyed overcoming their struggles with them. But enjoying something is certainly not the same as being blown away by it. A few months ago, Holly (the main narrator) lost Adam, her boyfriend of 2 years, to an accident up in the mountains. Of course she is racked with devastation, but I feel like we're told that more than anything. We're told that she has been awful, living in a black hole of despair, hardly showering or cleaning up after herself. Her pain was all on a large scale, but sometimes it's the little things that hurt the most. I would have liked more triggers throughout the story. Like what if a song reminded her of Adam, or his favorite sports team was playing on the TV or someone used a phrase that he said a lot. But throughout the entire novel, I don't think Holly was actually reminded of Adam, rather she was reminded of the night she lost him. Also, there wasn't really much that showed the impact of his absence in her life. That just made it so hard to feel like she missed him and was grieving his death. It was more like she was grieving the idea of his death. Then there was Holly's relationship with Carter. At first, she can't even hear the sound of his voice without suffering physical pain because it reminds her of The Night Adam Died. She dreads his presence. Then he shows up to a party that Holly is at, they have a conversation, and seeing him is really no problem. After one successful night hanging out, they become really close friends. Everyone besides them can see that they need to get down and dirty. Finally both of them do see it but they just don't want to ruin their friendship. I liked Carter, but my god, it's unconvincing and cliche. Yet the entire time I was rooting for them to just get over their hold-ups and get on with the bowchickawowwow. Their relationship was, at least, very sweet. Though I may not find it completely realistic, I liked that they made each other stronger and looked out for one another. In the end there was a lot of growth for both of them and I was satisfied with how things turned out. The writing wasn't bad, but it also wasn't mind-blowing. There were quite a few cliches, and some of it lacked the proper depth. Certain passages that were obviously supposed to be profound and thought-provoking, supposed to be beautiful, were actually pretty MEH to me. I really liked Jenna. She was a fantastic friend to Holly. For me, strong, genuine friendships make a story four zillion times better. I guess you could say Jenna and Holly's friendship was one of my favorite aspects of the book. 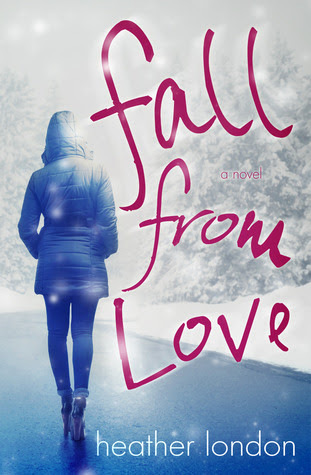 I know it seems like there is a lot of negativity in this review, but I did enjoy Fall From Love. Though I'm not going to go around gushing to everyone and shoving it in people's hands, I think it is worth reading. Learning how to love again, to face your fears even when they seem insurmountable, and learning what risks are worth taking... Powerful ideas expressed through an intriguing situation and likeable characters. And, as I said, it might just be me. Others will probably find this more emotional than I did, and others will probably connect to it better.